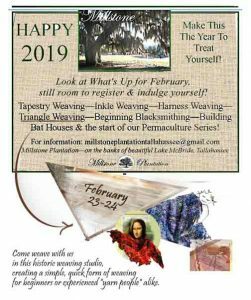 Heads Up… Millstone Institute for Folk Arts is hosting my next Workshop – a wonderful, historical location for this fun technique. More below. A little history: Millstone is where I got started, waaay back with my 1st two lambs, Bambi and Filene. Bambi was a real “character”, butting heads, trees, and finally, me. He didn’t last too long after that. Filene became “Head Ewe” of the flock she great-great-grand-mothered through several generations. I joined the guild, meeting every Spring Farm Days at the “Jr. Museum” for the annual sheering and “Sheep To Shawl” demos. Jesse Conrad brought Millstone’s ambience, knowledge, and skills to show me how it was all done. The shearer “Otis” sheared not only the Museum’s sheep, but truckloads of local farmers’ sheep that were shipped in for the event. We, the spinners and weavers, would roll out the fleeces on a long table, “skirt” the dirty tags off, and roll them up from neck to end, exposing the inner side out with rich, textured crimp of the fiber, moist with lanolin. Each spinner spun yarns, which were transferred to the loom and woven into a full length shawl. We’d all take turns, completing the process in 2 days. The 100% handspun/handwoven shawl was auctioned off at the end of the day. A great way to learn the process– I continued with other festivals’ sheep-to-shawl activities, often as contests, awarding the spinner or weaver who did the most. It was fun! Back to Millstone. Jesse’s studio has been preserved and the original old house is being restored. Not just any old plantation on a hill, there’s a special aura with its heritage oaks, flock of sheep and alpacas, bees, garden, all overlooking beautiful Lake McBride. Millstone is developing a series of folkart workshops in wood, clay, metal, and fiber. I’m looking forward to seeing you there. $ 150 includes frame kit (yours to keep) and lunch. For more info on joining the class, contact Millstone. For questions on weaving/yarns, contact Alice. Ivy, the lamb, has found a place in my classroom demos. Since I’m a fiber artist, I often introduce myself by way of loading up all the weaving equipment and taking it to show students what I do. Starting with raw wool, it’s processed through carding, dyeing, spinning, and weaving. 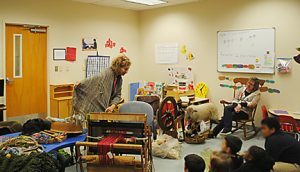 Often, the kids get hands-on experience by trying the loom and petting and feeding Ivy. Touching her wool, which is soft with natural lanolin, is a perfect way to present “texture”, one of my key concepts in many of the art activities. from the sheep’s perspective. Do they wonder why their wool is taken and what happens to it? At the time, SnoBelle, a real lamb, inspired the first chapters of YarnTalk. SnoBelle got her name because she was born in a dark woods late in the night, and in the process of helping her mother, I could hardly see beyond black trees and thick black undergrowth . But the flashlight picked out the new lamb, which shown wet and bright in the darkness, white as snow. From the start, SnoBelle was an adventurer. She grew up to become Ivy’s grandmother. Ivy is not fond of traveling, but once we arrive at our destination, she’s all for exploring and visiting with anyone who offers her a handout.I didn’t always have a lamb available that was small enough to fit in the car, or friendly or cooperative enough for visits. Ivy, actually two-yrs. old now, turned out to be a dwarf, and a bottlebaby. A neighbor helped feed her, familiarizing her with strangers and many dogs. At school, I give each student a small handful of grain, so that Ivy will go to each one as they sit in a circle and eat out of their hand. It tickles and the kids laugh. (It seems sheep will do anything for grain. Walking into one new classroom, she once made a beeline for the empty hamster cage, and devoured the leftover grain before I could pull her away. ) Hence the sheep’s #1 rule in the stories: “EAT food! ALOT.” Surprising even to me, Ivy follows on a leash and I found that while I’m talking to the class, she doesn’t need to be held and will just hang around and watch. See her in the photo, behind the spinning wheel. Most of our trips are an hour or two visiting a single class, but at one school, she was “on the job” the entire day, interacting with several classes while 200 kids waited in line to pet her. Ivy is a trooper and just as curious and independent as SnoBelle is in the stories. For school visits, camps or private groups/birthdays, if you’re in the Tally area and would like a visit from Ivy, contact me for more info. You may also see more photos and art activities listed on my pages, “YarnTalk“, “School Presentations“, and “Dyed ‘N Wool Art Activities“.